THE SCHLAGER SYSTEMS: BUCKS FIZZ IN REUNION AND PLASTIC SURGERY HORROR!?! BUCKS FIZZ IN REUNION AND PLASTIC SURGERY HORROR!?! Shock news from that reliable source 'the Sunday Mirror' that all four original members of Bucks Fizz are to reunite for a one off concert for a TV show called 'PopGoes The 80's', where Bobby, Mike, Cheryl and Jay will have plastic surgery to wind the clock back 27 years. Reporter Lara Gould informs readers that a source "close to the band" say that the band wont let old differences get in the way this time! Apparently Bananarama, Visage and 'soul diva' Chaka Khan will also appear in the series. No word from any of the Bucks Fizz camps at the moment as to the truth of this report but considering both Bucks Fizz and the Original Bucks Fizz have busy touring schedules, it seems highly unlikey if not rediculous! 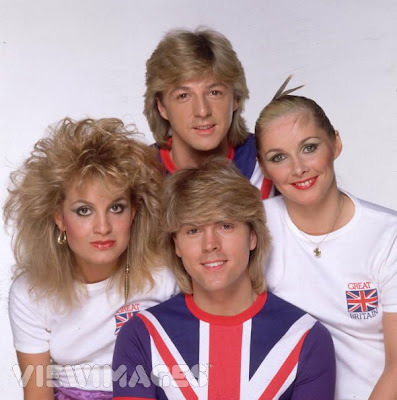 Mike, Cheryl and Shelly Can be seen on Saturday night at the Scala as the Original Bucks Fizz as part of the Eurovision Winners Party. Bucks Fizz (official) featuring original band member and lead singer Bobby Gee will be appearing in the Schlager Systems home town of East Kilbride on June 28th. The Schlager Systems will be covering both events!